We saw the Mocha cat cafe in Harajuku pretty much instantly as we walked in the gates to Takeshita Street. My daughter squealed in delight at the photo of the cat wearing a top hat. Trying to convince her that cats don’t wear top hats was a non-starter since she really had to see for herself. We trudged along behind her up the stairs to another cat cafe in Tokyo. And, to our surprise, Mocha cat cafe was absolutely charming, mostly due to its pristine kitties and their Alice in Wonderland themed premises. 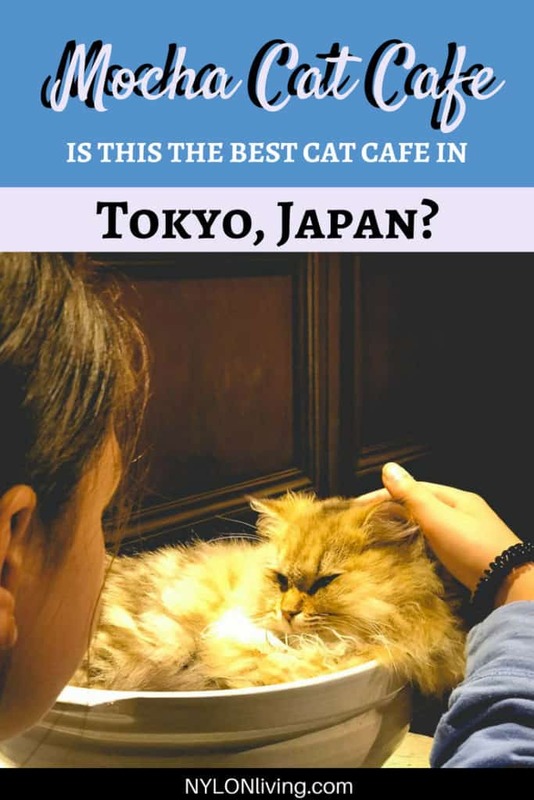 We felt the Mocha Cat Cafe was the best cat cafe in Tokyo (and we have done a completely unscientific random site testing of 5 cat cafes in Japan including Kobe and Kyoto). Why? The best way to keep my daughter happy on our 2 week trip to Japan was to promise her a visit to an animal cafe. Bribery, rewards… it’s all the same thing. 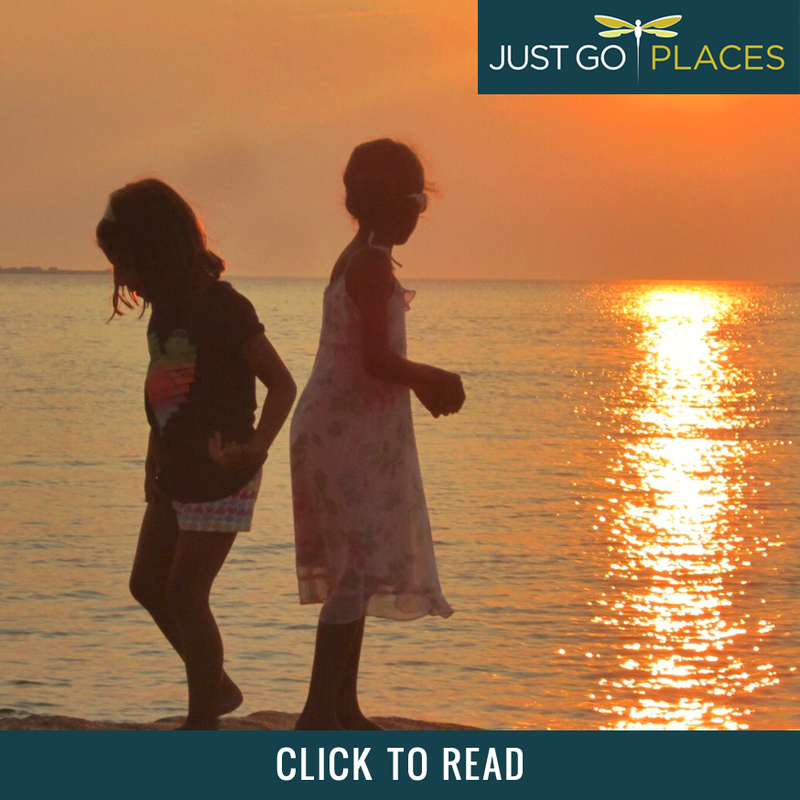 My twins were 12 years old but they did not ask us about their age. Technically children need to be 13 years old to enter the cat cafe Mocha. As you can imagine, they don’t want little kids harassing their cats. 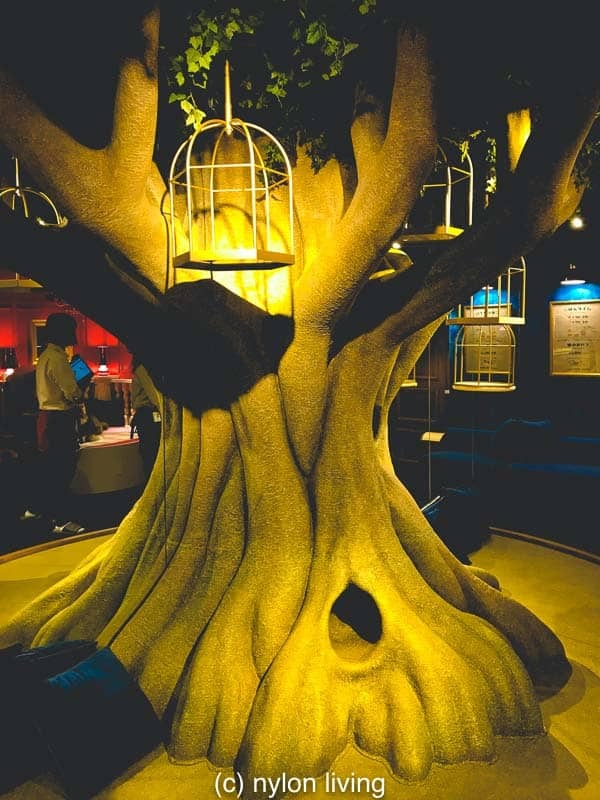 Tip – If you have younger children, there is a bengal cat cafe nearby. We saw very young children at the Bengal Cat Cafe, including under 5’s who could not possibly be taken for teenagers! 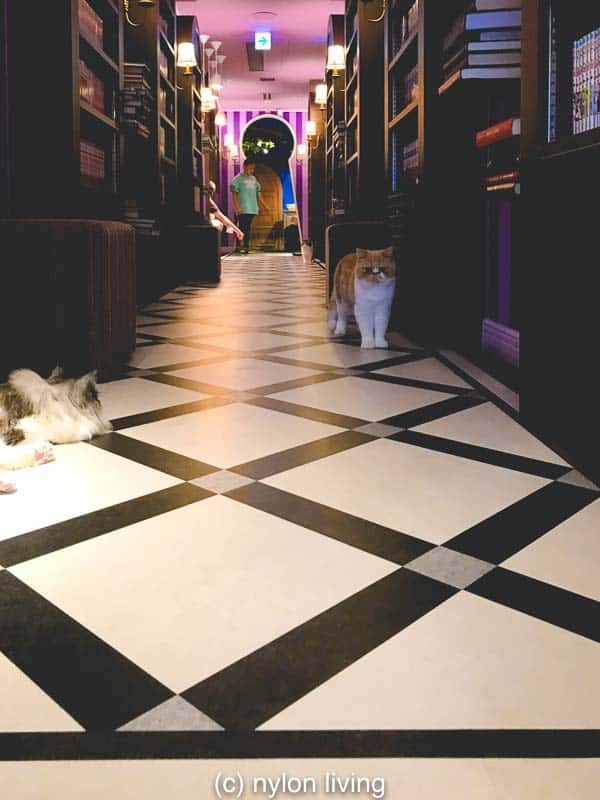 This cat cafe in Harajuku is spacious and has two large rooms separated by a hallway. In fact the Mocha cat cafe was bigger than our hotel room! You can see the cats being fed at 10:30 in the morning and 7:30 at night. Alternatively, you can buy them treats and they will be your best friends. For your kitty viewing pleasure, here are the some of the 23 residents at the Mocha cat cafe. It is hard not to fall in love! This cat is evaluating who will be the recipient of his attention. 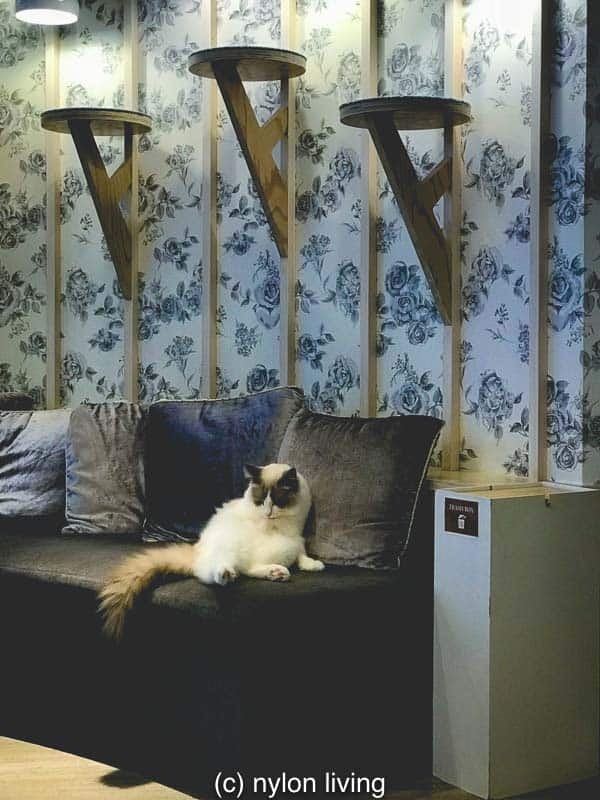 What did we rate this the best cat cafe in Tokyo? 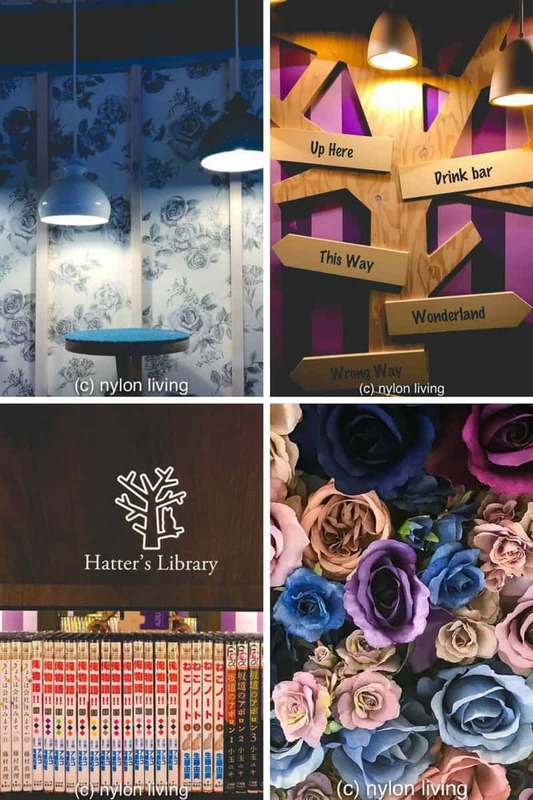 What did we raise our eyebrows at the Mocha cat cafe? You pay by 10 minute increments so the cost adds up quickly. Trying to usher enchanted children out on a timed deadline is wearying. You can buy extra treats so that the cats will pay more attention to you. Like all other animal cafes, you are forced to buy a drink even if you stay the minimum amount of time. False advertising! My daughter was sad there were no cats in top hats. A kitty play tree in one of the rooms. The cat cafe Mocha in Harajuku is open from 10AM to 8PM all year round. There is an entrance fee as well as a timed fee that clocks in 10 minute increments. Keep track of your time or it will add up! Note – You need to be aged 13 (or at least look it) to be allowed to enter. 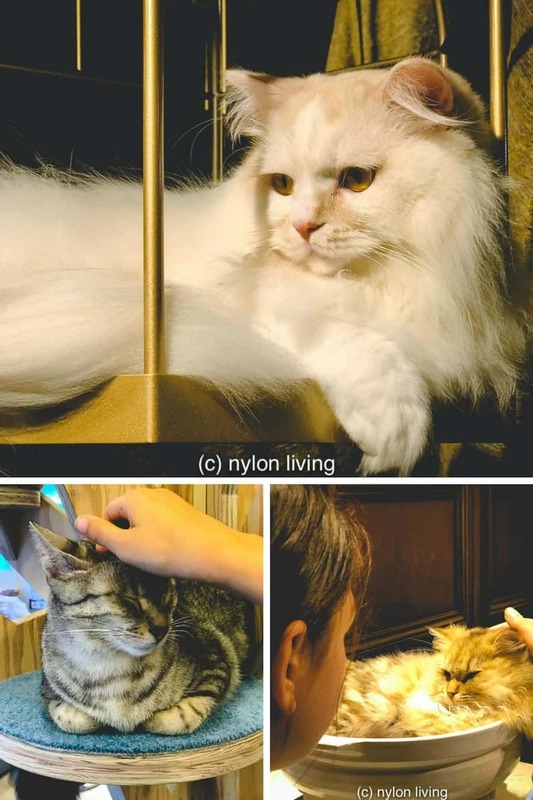 There are other cat cafe Mochas in Tokyo where the times may differ. For example, the Mocha cat cafe in Shibuya is open until 10 pm. The 7 stores in Tokyo are all located in easily-accessible central Tokyo spots like Shinjuku, Akihabara and Ikebukuro. The cat cafe Mocha is also available in cities other than Tokyo, for example Kyoto and Osaka.